I have three projects due next week. I have a full day training to take on Friday, Saturday and Sunday. So I have just today to work intensely on the two projects. The generator suddenly stopped working yesternight and there is no electricity. I also have to pay January VAT today or I will get slammed a late payment fine. On top of it all, the week after next week is equally a busy one with many projects coming due in that week. I don't know if I will be able to meet the deadlines. Two are already past their deadline by over two weeks now. But I do know that I need a miracle. And this is just a bigger version of how my weeks have been this year. Every week I have to juggle attending meetings, sending proposals, on-site consulting for a few clients, programming, delivering clients' jobs, online marketing, writing daily and doing administrative tasks. Some weeks, like this one and next week, are like walking through hell. I try to not look at all the tasks I have to do because they feel so overwhelming that I lose all motivation and feel like giving up. The way I boldly face these challenges are by staying positive and not giving up. I have once missed my VAT payment last year when I had similarly tough weeks one after the other for over a month. It was almost a crisis period for me. This year already I have been missing many deadlines and unable to pursue a lot of big jobs. I have two pending foreign client jobs that I have stopped trying to close as I'm not sure I'll have the time to do the jobs. I have many current jobs I simply want to be done with and maybe take a good rest. 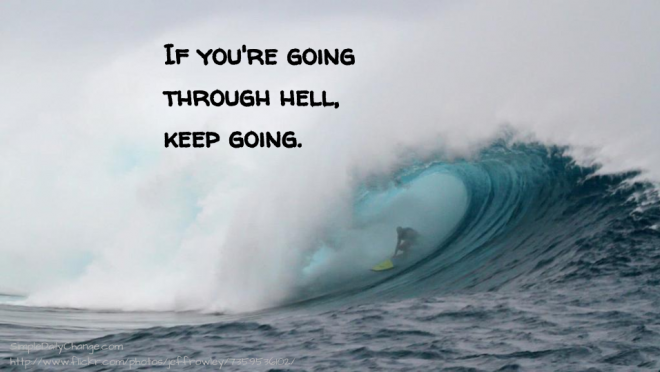 For weeks now, my motto has been the war-time quote by Winston Churchhill -- "If you are going through hell, keep going."